When the Mets hired Sandy Alderson as general manager in October 2010, fans cheered the choice of a forward-thinking baseball man who is respected around the game for his forthrightness. But a little over a year later, the Mets ownership is in far worse financial shape than was publicly known at the time of Alderson's hiring, and the latest financial news — that the team could add as many as seven minority partners — does little beyond addressing some short-term financial needs (such as a roughly $25 million debt payment on Citi Field) while saddling the club with an MLB-record amount of debt. All this, in turn, has led to a shift in Alderson's public statements about the Mets' projected payroll. 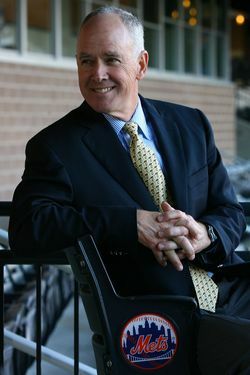 At his introductory press conference, Alderson said he wanted to be in the free agent market every year, pointing out that the enormous amount of money coming off the books following the 2011 season would create a one-year delay in doing so. At the time, team payroll was “close to the maximum,” according to team COO Jeff Wilpon, at around $145 million. By February, Alderson provided a range of $130 to $150 million for 2012 payroll. Indeed, while Alderson has been publicly paying lip service to the value of Jose Reyes while sending signals that the Mets won't be major players in the bidding, Fred Wilpon couldn't even be bothered to follow through on the ruse, responding to a question about the importance of signing Reyes at last week's owners' meeting by saying, “What kind of question is that?” and walking away. Of course, this is all likely the result of ownership's changing financial realities, as opposed to Alderson's own spending preferences. But it's disappointing to see this era in Mets history marked with as many shifting statements as the previous few — maybe even more disappointing than the prospect of Jose Reyes in another uniform next season.